Tranquil but convenient location with panoramic views. 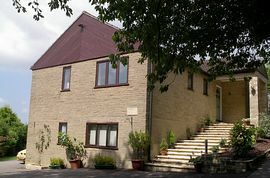 Chestnuts offers luxury en-suite accommodation in an architect designed house with panoramic views over Glastonbury. Rooms have contemporary furnishing and spacious modern bathrooms. All rooms have a hospitality tray, Digital TV, free wireless internet, hairdryer, crystal salt lamp. We have private parking and are only a few minutes walk from the Tor, Abbey and Chalice Well. 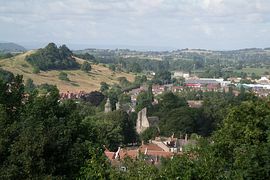 Wells, Clarks Shopping Village, Bath and Cheddar Gorge are all within easy reach. 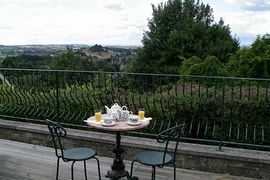 We are pleased to offer a range of breakfasts using local and organic produce. Jane is a Reiki master and complementary therapist and offers treatments including aromatherapy and reflexology. Our aim is to ensure you enjoy your stay and we look forward to welcoming you. Single occupancy from £45.00 to £65.00. 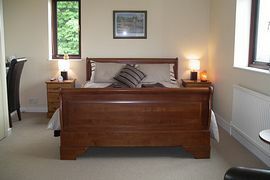 Twin room from £70.00 to £80.00. 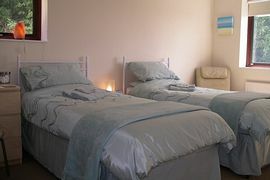 Double room from £68.00 to £85.00. Special Diets Provision: Special diets are catered for. Most diets catered for with notice. The nicest B&B ever. Would love to return Superb house in magnificent location. Luxurious beds and brilliant hosts, thank you. Thank you for a magical stay and looking after us so well. I arrived stressed and left fully relaxed. Wonderful. From Glastonbury. Go to the top of the High St. Bove Town is just across the road to the left. Proceed up Bove Town, past Bushey Combe Gardens and a further 50mtrs on the left is a private drive that turns sharply back on itself. Turn here and Chestnuts is the house with the large steps at the side.